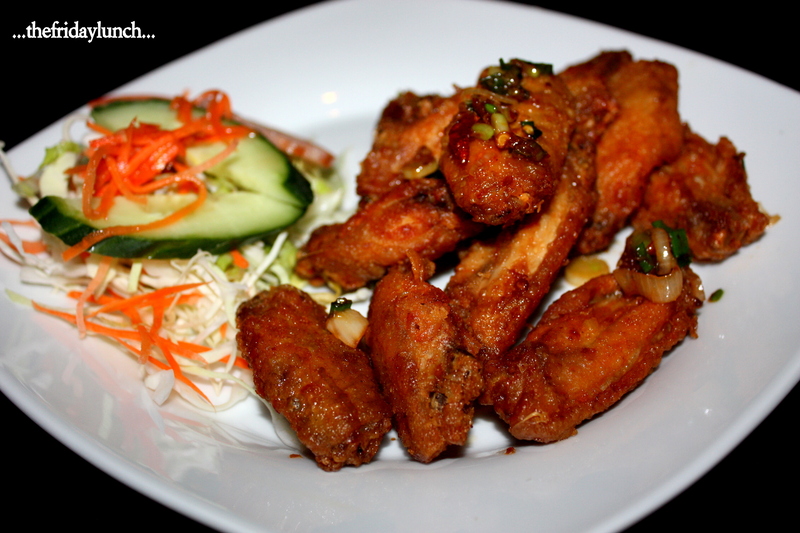 The Cánh Gà Chiên Nước Mắm (Saigon-style chicken wings) were tasty, crispy little critters. Fried to perfection and tossed in chile, garlic, scallions and Nước Mắm. A bit sweet, a little salty…good and garlicky. BTW, don’t forget to eat the greens…that’s a nice, crunchy, flavourful salad. The Royal Platter…a plethora of tasty snack treats. Going round the plate, first off, the Chả Giò (Vietnamese Spring Rolls). Fairly decent, these were. The ground pork filling, again decent, was a touch on the mushy side. I found it strange that they would use the wheat wrap instead of the rice version. Turns out they offer both. 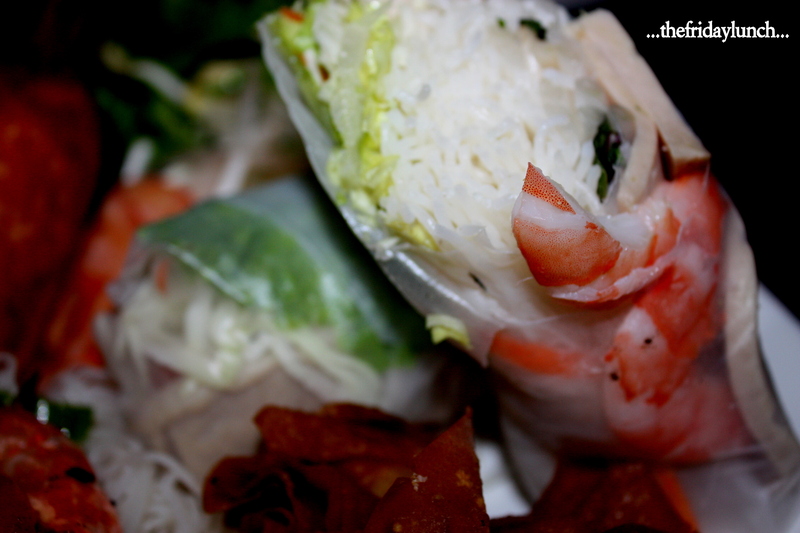 If you prefer the rice wrap, order the Le Saigonnais Rolls. 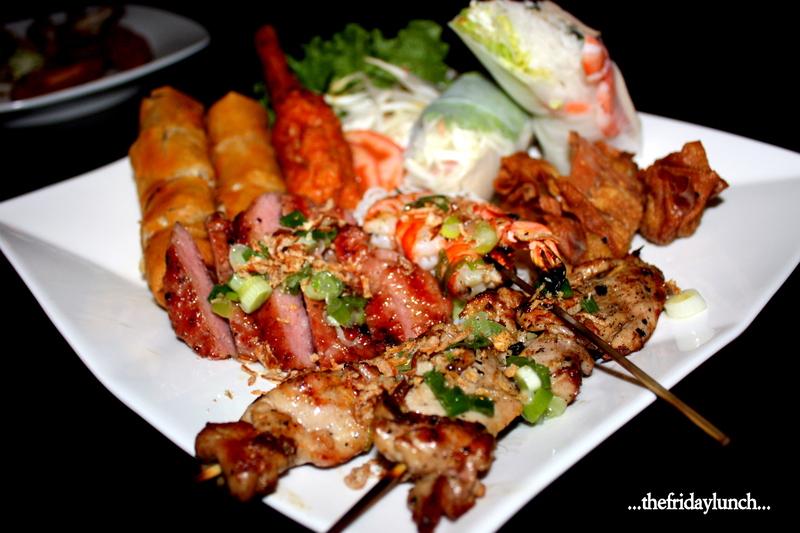 Nướng Xiên (Grilled brochettes). These were stellar. 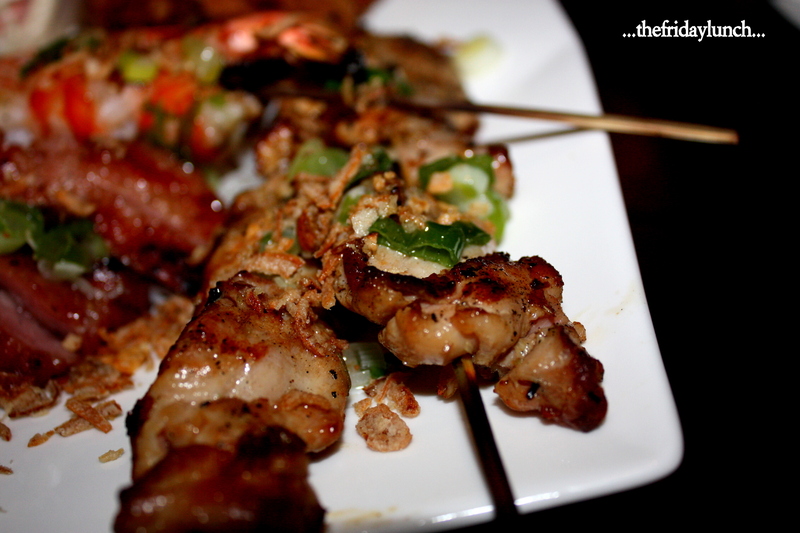 A combo of pork and chicken, grilled to perfection, still juicy and completely jacked with great flavours. 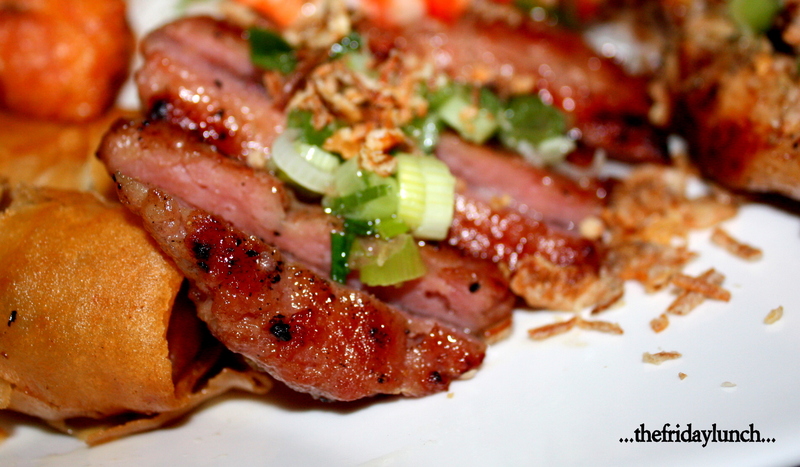 The Nem nướng (Grilled pork patties) are basically Vietnamese bologna. In that I mean it’s bologna taken to the next level times two. The mix of sweet and savoury with a big hit of garlic make these outstanding. Pretty sure the dose of MSG thrown in helped things immensely. Very, very addictive. 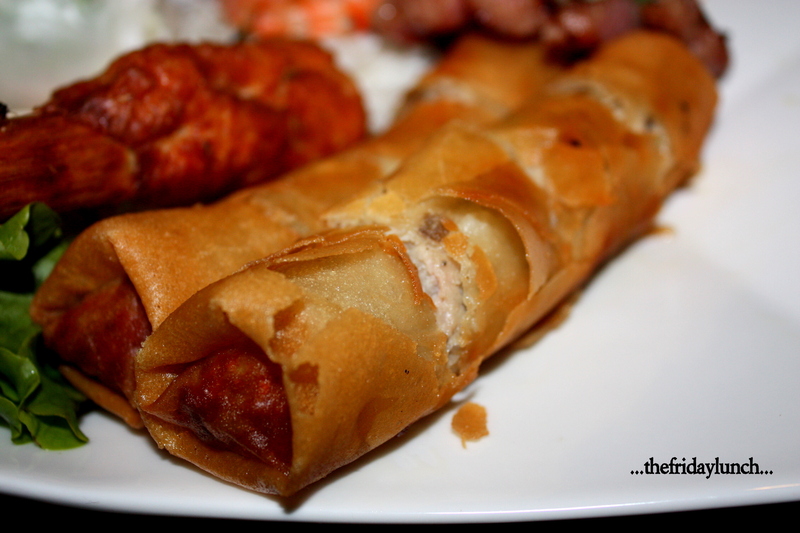 There’s a great recipe here for Nem nướng spring rolls. Gotta try making these real soon. Chạo Tôm (Prawn Supreme on sugar cane). Here you’ve got a mix of minced pork and prawn, garlic, shallot, fish sauce, palm sugar and pepper wrapped around sugar cane. I’ve had better and I’ve had worse. These were a touch rubbery…a moment too long on the grill. 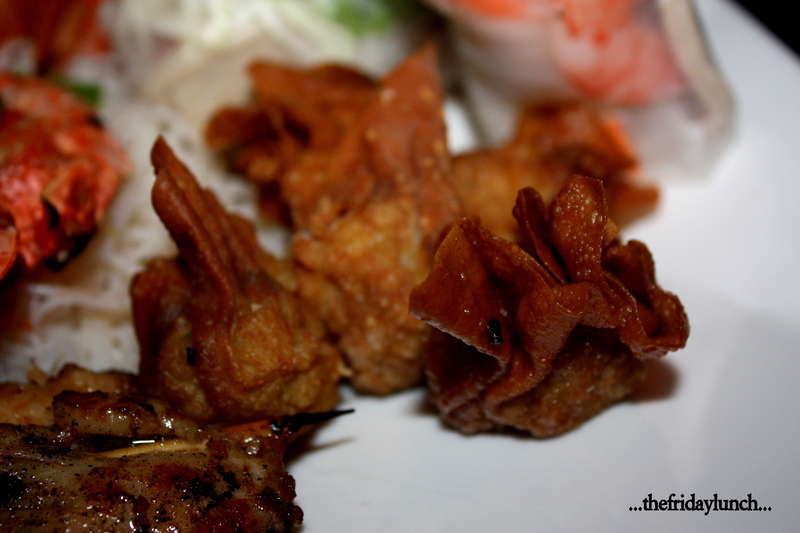 Hoành Thành Chiến (Crispy wontons)…great little packets of minced pork and prawn. The last item on the platter was, unfortunately, on the average side. It’s not that they were bad, but the Gỏi Cuốn (Salad Roll) was just a bit top-heavy on the noodles…they diminished the fresh prawn and Vietnamese Ham a bit. 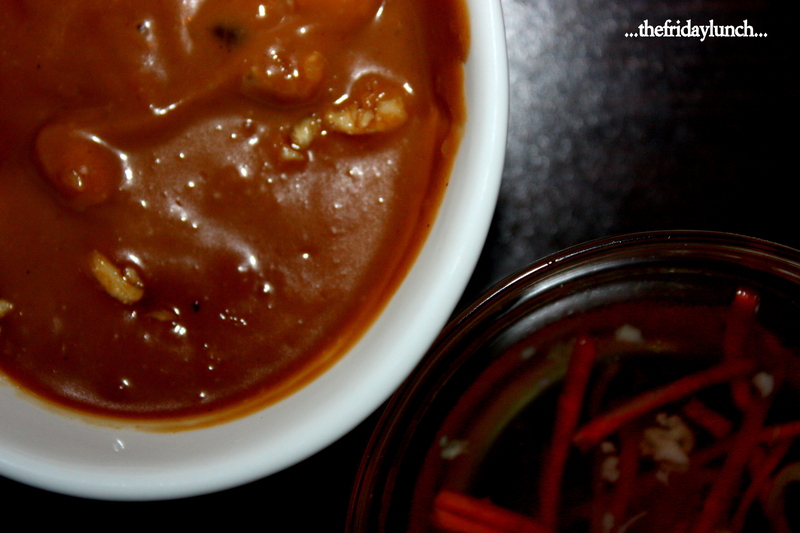 The saviour here was the dense and delicious peanut sauce. Rich, deep flavour through and through. 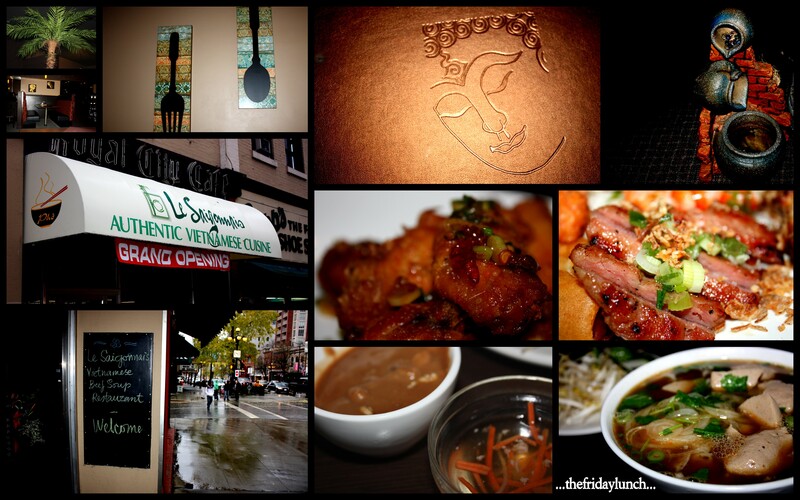 I usually get my Vietnamese fix at Green Bamboo and other assorted locales throughout Vancouver. 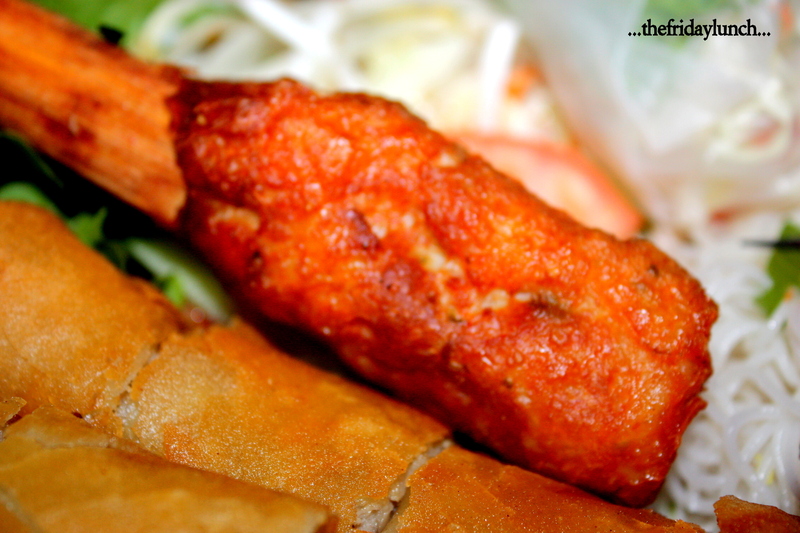 It’s good to know there’s a place nearer to home that offers up a variety of interesting Vietnamese fare. 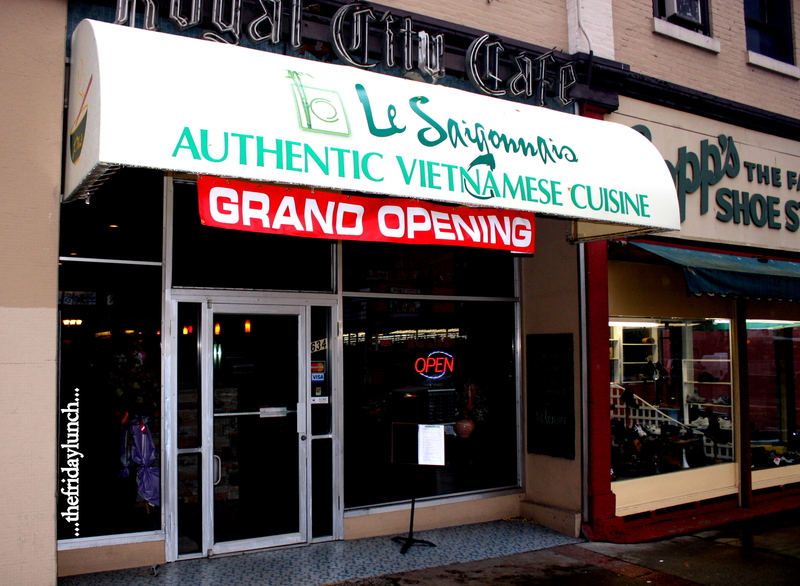 Le Saigonnais is a clean, comfortable spot to experience a wide variety of Viet cuisine. Very highly recommended. This entry was posted on November 25, 2011 by Karl. It was filed under Bún bò Huế, Beef Noodle Soup, Chả Giò, Gỏi Cuốn, New Westminster, Spring Rolls, Vietnamese, Wings and was tagged with New Westminster, Vietnamese. This is good news for me living in Coquitlam! Looks like New West is getting some good places. We just found out our regular dim sum place, the Kirin (in Coquitlam) has closed permanently. The next closest location is the one in New West which we will try next. Hi, Michelle! Too bad to see a favorite go down. We definitely need to get together for another feast…possibly Dim Sum if your up for it. That would be great to get together for another feast! I just read your new post for Red 6 and I’m drooling at your photos there too! Hey Shoku! Got give Urbanspoon and Kevin Wu the hat-tip for this one. I rarely venture down the hill…this one was a pleasant surprise! Its definetly a great Rest. great food great service and above all Great PRICE. Thank god! I thought I was the only person who missed Royal Thai. I work just up the street from here and I was so sad to see Royal Thai close their doors suddenly and without explanation. I absolutely loved the soup they served with the lunch special. I don’t know what it’s called but I would just die to be able to get some more. I tried this place once when it just opened and it really wasn’t too impressive. But I will go back now that it’s had a chance to be open for a while. 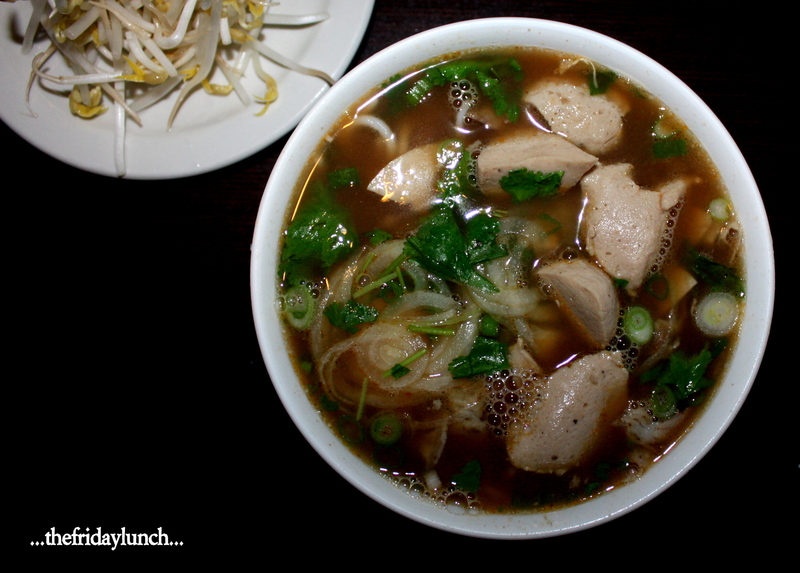 The soup you had was probably Tom Yum. Lhy Thai on Edmonds does an excellent version. Hello Thai New West! I`ve been eagerly awaiting your opening. Cannot wait to be delighted!! Does anyone remember a place called Asian 54 on Kingsway and Royal Oak? They closed about a year ago. I miss that place!